Has your mother ever told you to eat your veggies? Well, May is National Salad month! 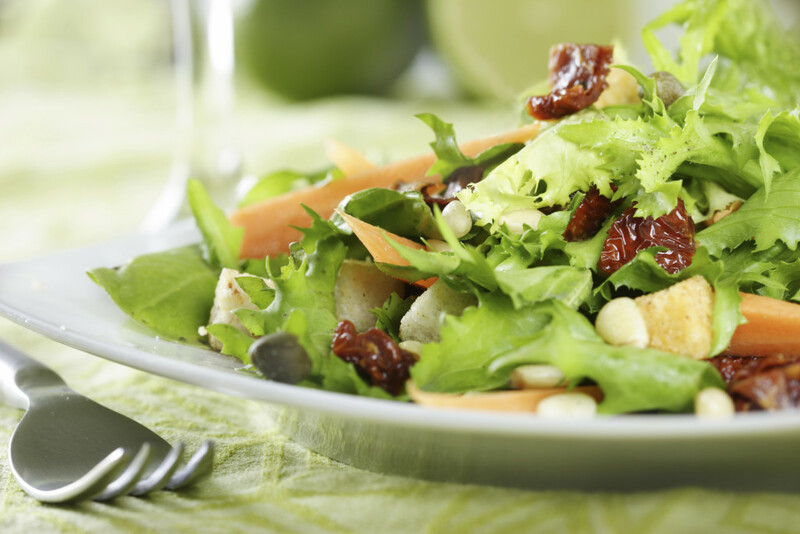 Incorporating salad into your diet can provide you with so many health benefits. As a matter of fact, we encourage patients to have a balanced diet to aid in the healing process post-surgery. Raisins are not just food trail mix and baked goods, they’re also a great additive to salads. These sweet, dried fruits are simple to add on your salads and you can take them on the go if you’re looking for an extra snack. Since raisins are an exceptional form of fiber, they can help relieve constipation. They can even give you an extra boost of energy too! Being healthy doesn’t mean you have to ditch the dressing. Most people cant eat a dry salad without a hint of dressing to “dress up” their greens. Pick an alternative dressing to ranch, and read the label. Some of the healthier salad options include low-fat Italian and raspberry vinaigrette. You can even make your own healthy version of dressing! Remember, moderation is key! Are you sick of lettuce. Dig into spinach! Spinach is incredibly good for you. It’s low in calories and it’s an exceptional source of potassium, calcium, and iron. The list goes on for spinach, but now you know why Popeye thrived on the leafy greens. Almonds can give your salad a tasty and crunchy kick. They are great for your heart’s overall health, and they can help reduce your chances of a heart attack, as well as assisting with lowering cholesterol. With any surgery, it’s important your heart is healthy before you undergo your procedure. Did you know there is a “good” kind of fat? While almonds do contain fat, they can aid in weight loss! Those who ate nuts at least two times per week were 31 percent less likely to gain weight than were those who never or seldom ate them in a study involving 8865 adults. With summer being just around the corner, strawberries are finally back in season. Cut up a few strawberries and mix them into your mix of greens. They’re packed with antioxidants, and they’ll help cure your sweet tooth. With them being low in calories, you don’t have to worry about ruining your diet. As a matter of fact, the nutritious berries can even help with anti-aging efforts! So, get creative with your salads. You can search tons of recipes on Pinterest and health websites. This tiny adjustment to your diet can make all the difference in your overall healthy, as well as your healing process post-surgery. If you have any questions about nutrition and your body post-surgery, give us a call at (404) 257-9888.